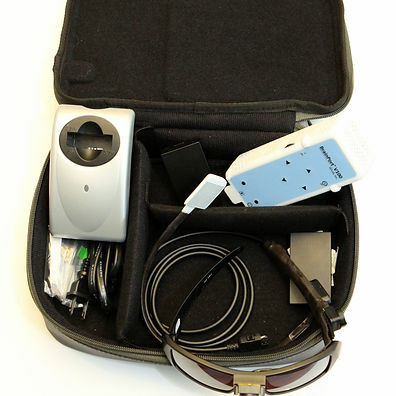 No, the BrainPort® V100 system is classified as an oral electronic vision aid. It works like a 400 point refreshable Braille display from which you learn to interpret the bubble-like patterns on your tongue as representative of objects in their surroundings. The technology works best for individuals who have no useful vision (light perception or no light perception), have already completed traditional blind rehabilitation programs, and are committed to training and practice. Individuals with medical electrical implants or oral health issues should consult a physician prior to BrainPort V100 use. What does stimulation feel like on my tongue? Electrical stimulation can best be described as sparkling water or vibrations on the tongue. You control the strength of the signal to maintain a comfortable sensation. Can I try the system before I buy it? Yes, we offer a free 1 hour trial at each of our partner training facilities! This will give you a high level understanding of the BrainPort system and how it works. You can then decide if you would like to attend a complete training program. Tell me about the complete training program. Training is a minimum of 10 hours, spread over a 3-day period, with a certified instructor. People typically improve their device skills and abilities with practice and many benefit from additional professional training at regular intervals. The training is currently conducted at one of our four independent training sites in NY City, Chicago, San Francisco, and Springfield, Missouri (we will add more sites in the coming months). You are responsible for the cost of the training, (to be determinded by the independent training facility) plus all your travel, and living costs while attending training. If you decide to purchase the BrainPort V100 at the time of training, we will deduct the training fee from the price of the system. There are some health conditions that would limit the use of the system. Simply click here to fill out a patient survey to determine if you are a good candidate. Once this is reviewed, a certified instructor will be in touch to arrange a location and dates to complete the training. You will also need to obtain a prescription from your healthcare provider for the BrainPort V100, before training begins. What is included with the BrainPort V100? BrainPort V100 package includes the sunglasses with integral video camera, adjustable lanyard, hand-held controller, padded carrying case, 2 lithium batteries, battery charger, and user manual. FDA has recently allowed marketing of the BrainPort V100 in the U.S., however private insurance companies, Medicare, and the various Medicaid agents have not yet reviewed the device for coverage. As with all “new” medical products entering the market after FDA approval/clearance, the process of securing coverage takes time. The BrainPort V100 comes with a full two (2) year warranty. If there is a problem with the device, simply contact our Service Team and we will repair or replace the device.